The Fairchild PT-26A is a tandem cockpit primary trainer with non-retractable undercarriage and tailwheel. The Cornell has a fabric-covered welded steel tube fuselage. The remainder of the aircraft used plywood construction, with a plywood-sheathed center section, outer wing panels and tail assembly. The control surfaces are a metal structure covered with fabric. The Fairchild Model 62A-3 or PT-26A was evolved from the Fairchild Model 62 or PT-19. Model 62 was designed in 1938 by Fairchild Aircraft in Hagerstown, Maryland, to satisfy a military requirement for a rugged monoplane primary trainer. The Fairchild M-62 was a low-wing monoplane with a two-place, tandem seating, open cockpit and fixed landing gear and tailwheel and flew first on 15 May 1939. The aircraft was the winner on a fly-off competition later that year for the new USAAC training airplane. Following its evaluation, Fairchild Aviation was awarded its first United States Army Air Corps 'Primary Trainer' contract for an initial order on 22 September 1939. The original production batch of 275 aircraft with two open cockpits, were powered by a Ranger L-440 six-cylinder, inverted, air-cooled inline engine of 175 horsepower and designated the PT-19 "Cornell". The L-440 engines were developed and manufactured by the Ranger Aircraft Engine Division of Fairchild Engine and Airplane Corp. In 1941 mass production began and the PT-19 was upgraded with a 200 hp L-440-3 engine to the PT-19A. 3181 of the PT-19A model were built by Fairchild Aircraft; 477 by Aeronca Aircraft and 44 by the St. Louis Aircraft Corporation. The PT-19B model, equiped for instrument flight training, was similar to the PT-19A. The PT-23 variant was similar to the PT-19 but powered by a 220 hp Continental R-670 radial engine. A total of 1122 PT-23 and PT-23As were built in the US by Fairchild Aircraft; Aeronca Aircraft; St. Louis Aircraft Corporation and Howard Aircraft Corporation; in Canada by Fleet Aircraft Company of Canada and in Brazil by Fabrica do Galeao. The PT-26 variant was similar to the PT-19B except the PT-26 was fitted with a full length sliding canopy. 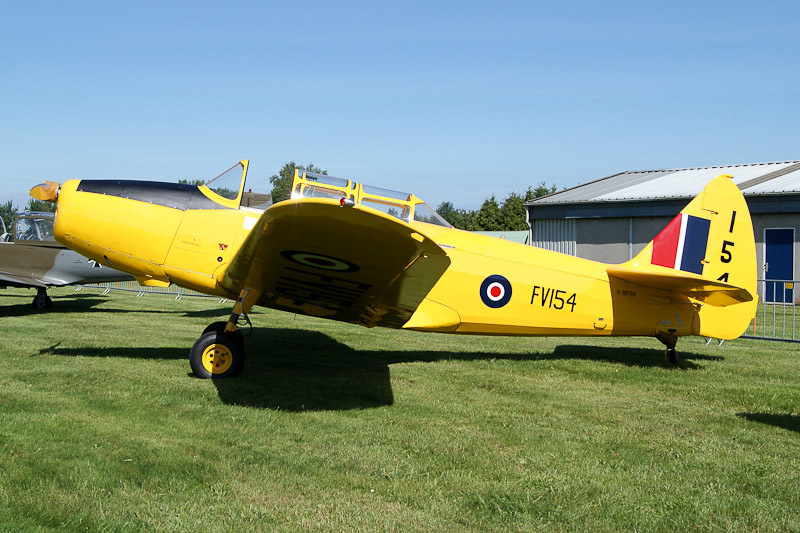 More than 1700 PT-26s were produced by Fairchild Aircraft Company and under license by Fleet Aircraft Company of Canada. A total of about 6500 of the Fairchild Model 62 with the main variants PT-19; PT-19A; PT-19B; PT-23; PT-23A; PT-26; PT-26A and PT-26B were built. Fairchild PT-26A-FE Cornell II FV154 c/n T4-4724 was built by Fleet Aircraft Company of Canada at Fort Erie, Ontario, under the Lend-Lease Act of 1940. Like all Cornells built by Fleet Aircraft Company of Canada, the aircraft was equipped with two identification lights, one along the top of the fuselage aft of the canopy, and one on the bottom of the fuselage. These lights were activated by means of two or more Morse code keys, one in each cockpit. The lights could be operated in either "code" mode or a steady-on position. The aircraft was transferred into the records of the no. 4 Training Command (T.C.) of the Royal Canadian Air Force (RCAF) on 12 May 1943 and accepted by the US Army Air Force (USAAF) on 13 May 1943. The USAAF number of this Cornell II was 42-65639. FV154 is the RAF Serial number assigned by the British Air Commission and also used as the Fleet Aircraft Company of Canada Serial No. The RCAF identity that appears on the RCAF record card is 15055. It's not sure which registration, 15055 or FV154, was painted on the aircraft. RCAF records indicate that PT-26A FV154 was taken on strenght by No. 4 Training Command of the RCAF at Calgary, Alberta, 18 May 1943. While there, the Cornell II amassed a little over 1168 hours of flight time. On 9 September 1944, the aircraft was put into Stored Reserve at No. 4 Training Command. On 21 October 1944, Cornell II FV154 was sent to No. 10 Repair Depot, Calgary, for some repairs. On 1 December 1944, the FV154 was put into Stored Reserve at No. 2 Transport Command, and remained there until 17 December, 1944, when it was moved to No.1 Reserve Equipment Maintenance Unit, Lethbridge, Ontario, and kept in storage until 20 October 1946. On that day, the FV154 was flown to Washington D.C., USA, and the next day handed over to The Office War Assets Administartion Foreign Liquidation Commision. Meanwhile the aircraft was sold by the War Assets Administrator to Alex J Somppi jr, how had a flying school at Tukwilla, Washington D.C. on 11 September 1946. Mr.Somppi applied for the first civil CofA for the aircraft, which was supplied by the Civil Aeronautics Administration United States of America on 2 October 1946. The aircraft was registered as a Fairchild M62A-3. Over the years, the aircraft passed through the hands of a number of owners, before it was withrawn form use in 1957 and stored as NC68711 at the airfield of Jacksonville, Michigan. In 2000, the airframe was discovered at Jackson airfield in a fairly dilapidated condition and it was acquired by its present owners, Egmond Aircraft LLC. in the condition as found. The airframe was shipped to Hoogeveen airfield in the Netherlands and was one of the first aircraft that had to be restored at the Hoogeveen Aero Park. On 15 March 2001, the aircraft was registered N58799 with Egmond Aircraft LLC., Lewes, Delaware, as registered owner. N58799 was registered as a Fairchild M-62A-3 using the RAF/Fleet serial no FV154 (the correct procedure as required by the FAA). After the defunct of the Aero Park, the Cornell II was restored by Jack van Egmond and his sons and a number of volantiers of Dutch Classic Aviators at the ATN facilities at Hoogeveen. After years of restoration, the Fairchild was given as airworthy on 15 June 2010 and the Cornell made it's first post restauration flight at Hoogeveen on 28 August 2010.